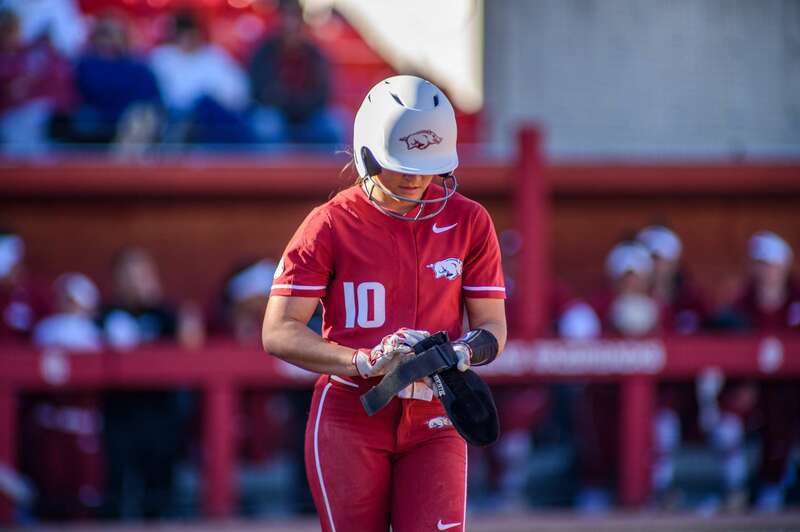 FAYETTEVILLE – The University of Arkansas softball team will return home to Bogle Park on Wednesday (April 10) to kick off a nine-game homestand that starts with a doubleheader against Wichita State at 4:00 pm (CT). Arkansas (26-14, 6-9) is looking to bounce back after getting swept at No. 8 Florida in Gainesville over the weekend. The Razorbacks host a pair of non-conference opponents at home against Wichita State and Furman while on their bye week from SEC play. Arkansas won its last non-conference game at Missouri State 2-1 on April 3. After a tough weekend in Gainesville, the Razorbacks are holding steady in the polls, cruising into Week 9 sitting at 26th in the NCAA Women’s Softball RPI, and ranked No. 18 by USA Today/NFCA, No. 17 by Fastpitch News and No. 22 by Softball America. The Hogs are also receiving votes in the USA Softball/ESPN poll. Wichita State (23-17, 4-5) has some momentum heading into their Wednesday in Fayetteville; after dropping its third straight game on Friday, the Shockers claimed an extra innings victory on Sat­urday and the series over UCF in Orlando 2-1 on Sunday. WSU won its first American Athletic Conference series of the season and will play its final non-conference road game of the season here at Bogle Park. Playing as the No. 13 national seed, the University of Arkansas softball team turned the program’s first-ever NCAA Regional host duties into the program’s first-ever trip to the NCAA Super Regionals. The Razorbacks rallied past Wichita State for a 6-4-win Sunday afternoon (May 18, 2018) in front of 2,142 fans at Bogle Park to clinch the team’s spot into the next round of the NCAA Tournament. The Razorbacks and Shockers have only met 11 times in a series that dates back to 1999. Since the first meeting, Arkansas has claimed seven wins, four of which were shutouts with one run-rule victory (Feb. 12, 2012). Head coach Courtney Deifel is 2-1 against Wichita State after dropping a March matchup to the Shockers on the road last season before defeating them twice during the Fayetteville regional. Under Coach Deifel, the Razorbacks have outscored the Shockers 11-5. After the mid-week matchup, the Razorbacks will host Furman for a three-games series beginning Saturday (April 13). Arkansas will then continue the nine-game homestand with a mid-week contest with UAPB on Tuesday (April 16) before hosting No. 7 LSU starting Thursday (April 18).